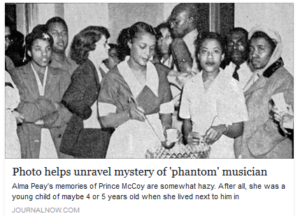 The First Baptist Church family warmly thanks our friends at the Winston-Salem Journal, especially reporter Lisa O’Donnell, for sharing this article about the connection between our church and the late musician Prince McCoy, whose contributions to the larger community have begun to come to light. Member Alma Peay shares several recollections in this story as well! Please click the image below to be taken to the story! Image and text by the Winston-Salem Journal.